This bauble is made for the Christmas Bauble group I joined. Using the template supplied I cut 4 baubles out and embossed them all on both sides with red/gold embossing powder. 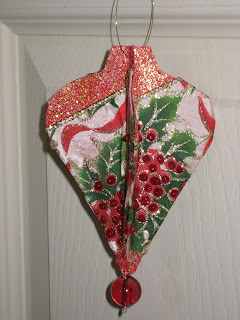 A sash of Christmas Holly ribbon was added at an angle across one side of each bauble. I then folded each pattern in half and glued all 4 together to make a three dimensional bauble. Though it says no beads I added a red berry bead to dangle at the bottom and added red stickels to the berries on the ribbon to give them a 3-dimensional look. I inserted gold wire through the top and added a red ribbon bow. The whole thing folds flat into one layer. I hope my swap partner likes this bauble. I don't think there is much danger of your swap partner not liking it!! It's lovely Paula and as Sherry says making it into a 3D bauble is a fantastic idea.